Hesteklinik Herning kan i samarbejde med beslagsmed Carsten Gammelgaard tilbyde specialbeslag med hestesko af træ. 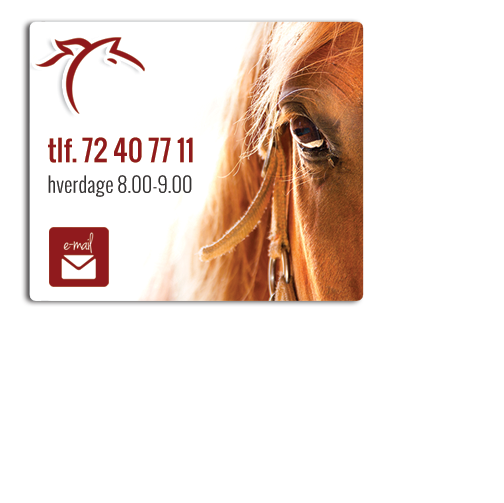 Denne behandling er velegnet til behandling af bl.a. forfangenhed og ringfod. For mere information - se engelsk beskrivelse nedenfor eller kontakt os. should be judged by veterinarian. -We improve horn formation, probably due to pain control and enhanced circulation. -2-3 months following shoeing, the new healthier horn growth will be noticeable. 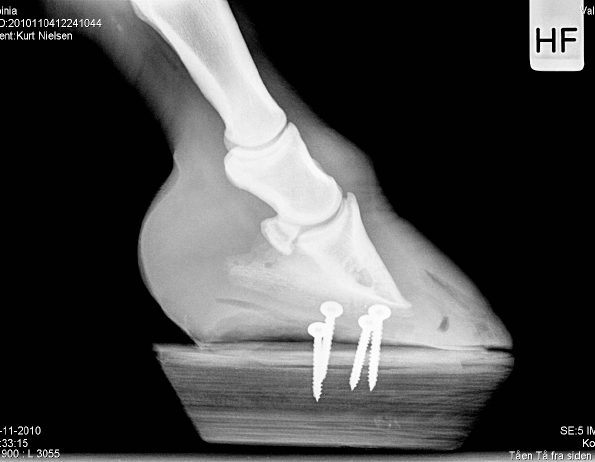 -Many acute cases of laminitis are actually chronic, following previous subclinical attacks. -Typically we leave the shoes on 8 weeks - in some cases up to 5 months in trial period. -We saw no cases of lost shoes in trial period. 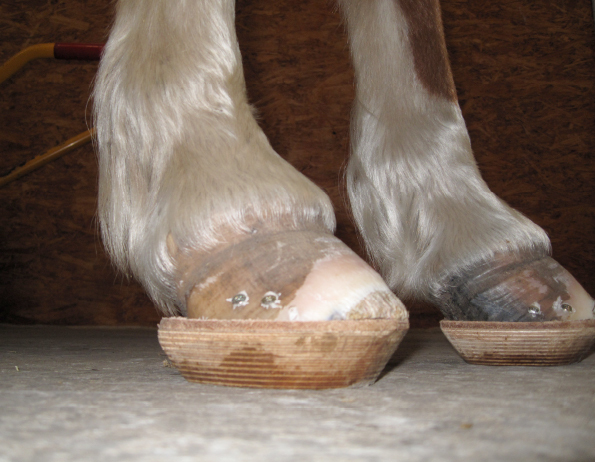 -Horses may enter light training on these shoes, obviously according to veterinary advice. -High degree of client satisfaction and compliance. Wooden shoes are manufactured in Kerckheart sizes 1 – 5. 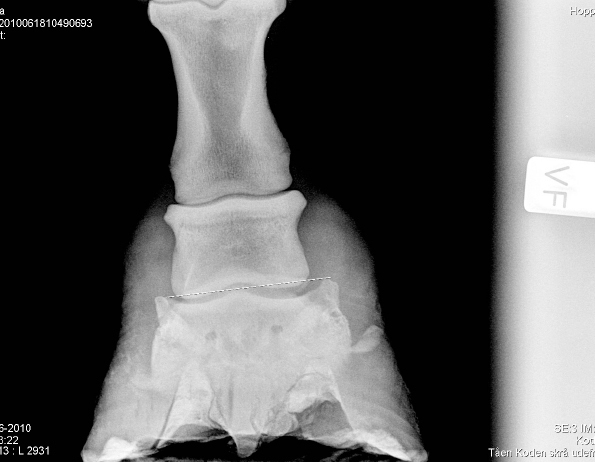 1.We always advice x-rays in front and side views (AP & LL). 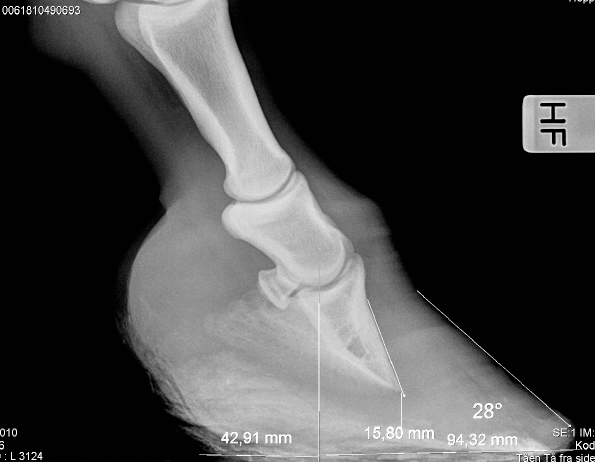 Notice that displacement of coffin bone also should be appreciated from front view, typically the bone sinks on inside, in which case, beside corrective rasping, we may put a larger shoe on, extending more lateral (outside) than hoof to redistribute pressure from sore inside. 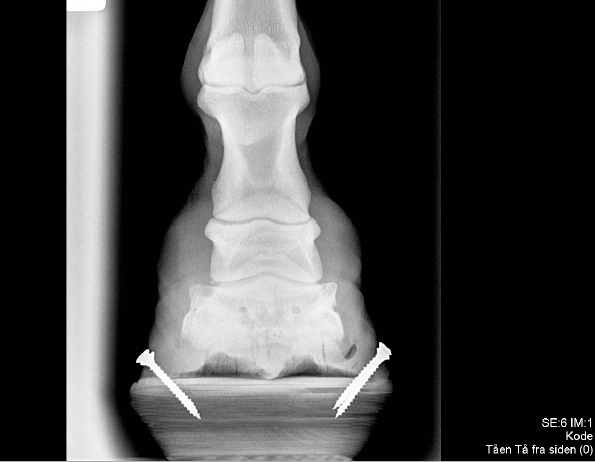 2.Rasp into balance following x-ray and clinical evaluation. 3.Start with most sore limb. 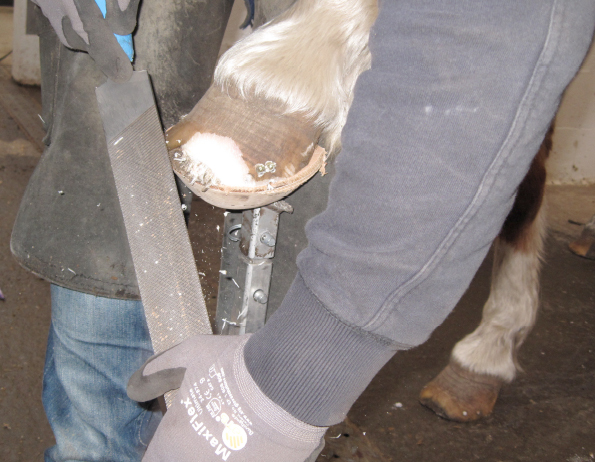 Following shoeing, the horse will stand more freely on this leg. 4.Usually we use a leather sole, but a wedge may be needed to raise heel. In either case fix sole to shoe with tape/glue to ease next steps. 5.Pack with silicone. With exudate from sole, following vet. advice, salicylic acid, may be appropriate. 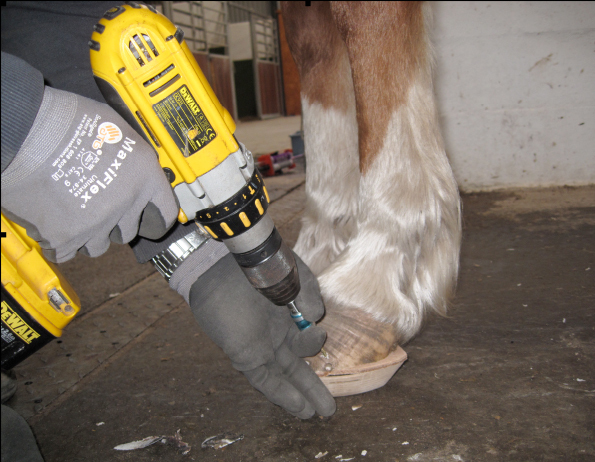 6.The hoof is placed onto the shoe (and sole) on the ground. 7.The enclosed screws are inserted downwards and centrally into the shoe. 8.Hoof wall and shoe are finally rasped. 9.8 weeks intervals are advised, in chronic cases maybe longer (3-4 months). 10.New radiographs are advised typically every 4-6 months.